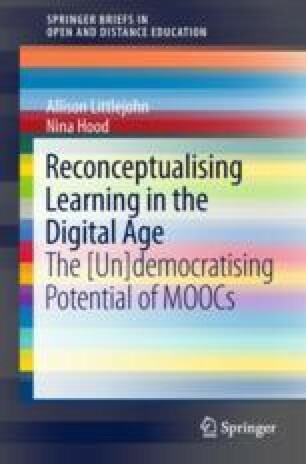 Drawing on the previous chapters, this chapter explores four tensions that characterise MOOCs. Although MOOCs are seen as an attempt to democratise education, they often privilege the elite, rather than acting as an equaliser. MOOCS are also considered a way to radically open access to education, yet they tend to offer education to people who are already able to learn rather than providing opportunities for everyone. While MOOCs are positioned as a disrupting force, often they replicate the customs and values associated with formal education, rather than unsettling educational norms. MOOCs are conceived as social networks that allow learners to learn through dialogue with others, yet many learners have limited interactions with others. Even when learners have the ability to learn autonomously, they often are expected to conform to course rules, rather than deciding their own learning strategies. These problems may be accentuated where MOOCs are viewed as a set of products (content and credentials) on sale to student consumers, rather than as a transformational educational experience for learners. The view of MOOCs as a product for the consumer learner may overly simplify the complex, transformational processes that underscore learning. Particularly where underlying automated systems try to improve progression by quantifying learners’ behaviours and ‘correcting’ these to fit an ‘ideal’ learner profile or where algorithms and metrics are based on convectional education, rather than on future-facing forms of learning. This chapter examines these problems with MOOCs, offering promising future directions. Downes, S. (2011). The MOOC guide. Retrieved from https://sites.google.com/site/themoocguide/home. Siemens, G., Downes, S., Cormier, D., & Kop, R. (2010). PLENK 2010–Personal learning environments, networks and knowledge. Retrieved from http://connect.downes.ca/.